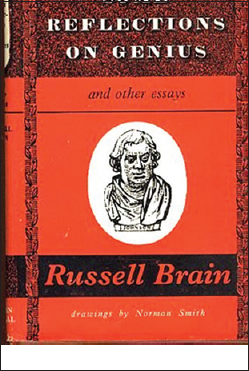 Brain, Russell: Some reflections on genius and other essays. Drawings by Norman Smith. London: Pitman Publishing Co. Ltd. 1960. 192 pages. Several batches of postgraduate students in neurology and neurosurgery at the Grant Medical College and Sir Jamsetjee Jejeebhoy Hospital and the other medical colleges in Bombay grew up learning about Dr. Russell Brain (1895-1966) from his student and our teacher – Dr. Noshir H. Wadia. Brain's Clinical Neurology and his Diseases of the Nervous System were our primers. The text on neurology was first published in 1933. As we graduated to journals, we studied Brain, edited by Dr. Brain from 1954 until his death. Gradually, we learnt more of the man and his work and the change from Dr. to Sir Russell Brain and later Baron Brain of Eynsham (in the county of Oxford) as knighthood in 1952 was followed by baronetcy in 1962. Dr. Brain had attempted studying history at New College, Oxford but later turned to medicine, obtaining his B.M. and B. Ch. in 1922 and D. M. in 1925. Dr. J. B. S. Haldane was one of his tutors in Oxford. His dissertation for the D.M. degree was based on a clinical study of increased intracranial pressure observed in patients with cerebral tumours at Maida Vale Hospital and the London Hospital. His studies on perception, speech and consciousness led to his enquiries on the mind. He was President of the Royal College of Physicians of England and Fellow of the Royal Society. Lord Moran, physician to Sir Winston Churchill, sought his help after the latter suffered a stroke. Work at the London Hospital and at Maida Vale – National Institute for Nervous Diseases included research on a variety of subjects including exophthalmic ophthalmoplegia, hereditary ataxia, remote effects of cancer on the nervous system and cervical spondylosis. His clinical analyses led to conclusions on abnormalities in Mendelian dominant and Mendelian recessive genes. One can only wonder at what he would have felt about our present abilities to localize precisely the errant genes and even attempt to restore them to health. Cervical Spondylosis: Its Early Diagnosis and Treatment, written with Dr. Marcia Wilkinson, featured autopsy reports and photographs that provided explanations for the clinical syndromes associated with this degenerative condition. Other studies were carried out with Sir Hugh Cairns, Dr. Dorothy Russell, Dr. George Riddoch and Dr. H. M. Turnbull. Dr. Pickering noted that throughout his clinical studies, Dr. Brain displayed four characteristics, which had already been apparent in him as a schoolboy: the power to observe, the urge to collect, the ability to discern logical relationships, and the capacity for scholarship and lucid writing. Dr. Brain married Stella Langdon-Down, granddaughter of Dr. John Langdon Down who described the Mongolian mental deficiency syndrome in 1867 that was later named after him. (Stella's brother, John, manifested this syndrome.) Dr. Pickering tells us that it was with her encouragement that Dr. Russell Brain decided to study medicine. Dr. Brain became a Quaker in 1931. This predisposition had disallowed him from fighting in the armed forces during the First World War. Instead, he served in the Friends' Ambulance Unit as part of his war effort. Blasts through the interstices of flesh. and the pale bone unknots the vapour of its mesh. Sinks to the level entropy of death. ‘Who but Brain could have contributed 'Socrates on the Health Service,’a series of 24 dialogues in the Lancet in 1959, exposing the controversies of the day with the merciless logic of the master? Socrates: Which is commoner, Appollodorus, wisdom or folly? Socrates: It would seem then that democracy must make it difficult to choose a wise committee, and if a committee reaches a wise decision, it is likely to meet with more disapproval than approval. Apollodorus: So it would seem in principle, Socrates, and experience bears that out. Socrates: And if, as you say, wise men are rare and foolish men common, the larger a committee, the more likely it will be to include foolish men. Whilst those on more than nodding acquaintance with the works of Dr. Samuel Johnson, Dr. Jonathan Swift, Charles Dickens and Jacob Epstein will be especially thrilled by the essays on them in this book, others will find in these essays, the spark that will make them want to learn more about these extraordinary individuals. All the persons dealt with here, barring Grock, the Scandinavian clown, lived and worked in Britain. Dr. Johnson has five and a half essays devoted to him. Dr. Brain discusses each of them wearing multiple hats at once – those of the literary giant, the physician and the humanist. To start at the beginning, Dr. Brain gives us his views on 'genius' – initially expressed as the Galton Lecture before the Eugenics Society. Expectedly, Dr. Brain soon moves from the definitions of the term to the cerebral basis of 'genius' and agrees with Dr. Cyril Burt, the educational psychologist, that the mental processes in geniuses must involve an extraordinary integration of perceptual and motor activities into a systematic whole. Dr. Brain questions the need to attribute a greater number of neurons to such individuals since the normal number of nerve cells is so large. It may just be that geniuses use these cells to much greater effect. He also dwells on words and the evolution of speech, which have enriched human thought to a great extent. 'The higher levels of conceptual thought are attainable only in the presence of a highly developed capacity for the use of verbal symbols.' He passes on to the roles played by memory, inspiration and use of the unconscious mind. In passing, he refers to the tenacious memories of Dr. Johnson, Coleridge and Shelley. These thought processes occur in what Galton called the antechamber of consciousness. Dr. Brain also refers to the excitement displayed by the inspired author and artist who is often compelled to work continuously till the task has been completed. When the inspiration follows a fallow period – termed the 'writers' block' by authors – it is all the more forceful. Poetic genius differs from that of the philosopher. The latter must dwell in the world of abstract thought. The poet, on the other hand, uses words to evoke images that move and delight. He may, incidentally also facilitate philosophic ideation. Dr. Brain's speculation on the neural organization in Shakespeare's brain makes interesting reading. He also deals with the special characteristics of great musicians that enable their rendering a perfect pitch and their very special ability to create memorable sounds and then passes on to a consideration of why music stirs emotion. He wondered 'why no composer of genius has been a woman' although women have a better appreciation of music in general than men. The brief discussions on idiot savant (a term now frowned upon), the genius traits demonstrated by those with grave mental disorders, and on the terms, nervousness and cyclothymi a (a mood disorder with similar but milder and more chronic characteristics of bipolar disorder) will leave some readers wishing for a more extensive consideration. The first essay on the man who was immortalized by his faithful disciple, James Boswell, focuses on Dr. Johnson's interests in science. Dr. Brain points out that Dr. Johnson thought of airliners a century and a half ago before H. G. Wells did and was acquainted with both electricity and magnetism. As the celebrated author of A Dictionary of the English Language (brought out in 1755 and was generally acclaimed at that time as 'one of the greatest single achievements of scholarship') he knew scientific terms and their derivation. He had also written biographical notes on individuals such as Dr. Herman Boerhaave (1668-1738 - physician, chemist and botanist). Dr. Brain corrects the misconceptions of Dr. Johnson's contemporaries, who dismissed his scientific interests as mere eccentricities. Dr. Johnson was specially interested in chemistry and had built for himself a portable laboratory which accompanied him during his travels. A biographer of Dr. Johnson took pains to point out that whilst he attempted transmutation of metals he did not don the mantle of the alchemist, preferring to carry out his studies merely to satisfy his curiosity. He used unusual methods to provoke experts. Visiting the Professor of Chemistry in Cambridge, he said, 'I have been told that there are two cold fluids which, when mixed, will take fire. I do not credit it.' Professor Watson asked his assistant to pour rectified spirit of turpentine into a crucible and into another, concentrated vitriolic acid. These were fastened to long rods, held out of the window and then mixed. Dr. Brain tells us that 'the flame which ensued was such as to induce Johnson to be thankful that the explosion was on the outside.' Even at the age of 74, Dr. Johnson attended experiments on new kinds of air (oxygen and hydrogen) by a physician at Salisbury. Neuroscientists may wish to pay special attention to the chapters describing Dr. Johnson as 'the great convulsionary' (which also dwells on his fear of death) and the succeeding 'A post mortem on Dr. Johnson.' The latter starts off thus, 'Johnson has a threefold interest for doctors: first as the friend of doctors; secondly, as an amateur of medicine and science; and lastly, as a patient.' At the end of this essay, Dr. Brain sums up his medical diagnosis of Dr. Johnson's various illnesses. I wonder whether chest physicians would have labeled his pulmonary problems as indicative of chronic obstructive lung disease. The essay on 'The Mad Poet Christopher Smart' brings out the poet as well as the neuropsychiatrist in Dr. Brain. I will leave you to study his analysis of the illness that converted an eagle into a flea, and of the poems Smart wrote whilst under the grip of his cyclothymia. This chapter is followed by a medical scrutiny of some of the characters so well depicted by Dickens. In the process, Dr. Brain brings in head injuries, cerebral arteriosclerosis, symptomatic epilepsy, paraplegia and psychiatric abnormalities, illustrating each diagnosis in persons such as Mr. Dorrit and Anthony Chuzzlewit, using Dickens' own words. You will enjoy his musings on Glock, the clown, and the repartee between Dr. Brain and the celebrated sculptor Sir Jacob Epstein (1880-1959) as Dr. Brain sat for the creation of his own bust. The final chapters give us Dr. Brain's views on symbols and images and on the words. In the former chapter, he includes thoughts on colour, pain and its pathways, perception, poetry and the views of Walter de la Mere and Dame Edith Sitwell. In 'Words' he traces the progress from the use of sound as a sign (as of danger) to its use as a symbol (word). The section 'The Neurology of Words' includes a discussion of handedness, cerebral dominance, speech, oratory and poetry. Walter de la Mare features here as well. The essay ends with the power of words to provoke laughter. The anecdote featuring the comment made by Dr. Hughlings Jackson to Dr. Rickman Godlee after his historic operation for removal of a brain tumour at Maida Vale Hospital on 25 November 1884 is delightful (page 189). I must not fail to draw your attention to the sepia tinted illustrations of the fat boy from Pickwick Papers and Grock, seen as soon as we open the book and then of each of the principal characters throughout the book. As you might expect, Dr. Samuel Johnson is featured not only on the title page but also at the start of each of the essays on him. Mr. Normal Smith deserves the credit for these enlivening images.